Chiang Man is the oldest temple in Chiang Mai. 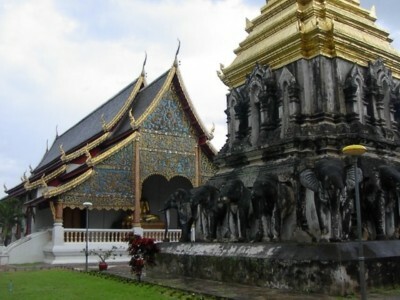 It was constructed during the reign of King Mengrai, who lived in the temple while overseeing the construction of Chiang Mai, the capital of the Lanna kingdom. The temple possesses one of the most treasured artifacts in Thailand—a Buddha image called the Phra Sae Tang Kamani (Crystal Buddha). One interesting aspect of the temple is its chedi (pagoda) which has 15 lifesize elephant carvings incorporated into its base. The Standing Buddha statue at the temple is the oldest Lanna kingdom statue that dates it to 1465.